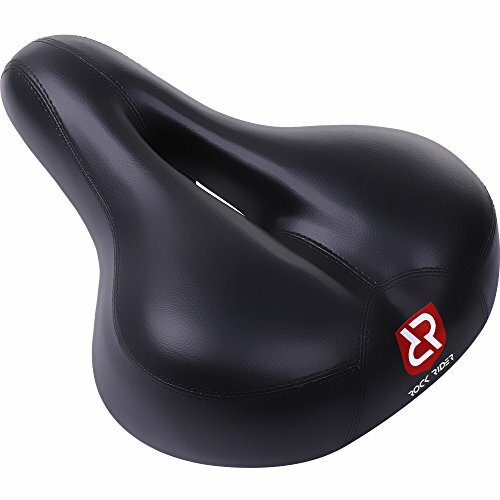 Rock Rider cycling saddle features smooth and heavy duty insert. Durable mounting wrench and foam seating guarantees a comfortable long ride. Coil spring suspension absorbs road shocks for comfortable ride on the bike. Weatherproof cover is designed for long-lasting use. Stylish rear logo make your bike attractive and more visible. Great idea for those who spend a long time on the bike saddle. The fabric cover is stretchable, breathable and weather resistant. Designed to fit all sizes of standard bike seat including exercise training bikes. Drawstring cords for quick and secure fitting to the seat. Can be used as cruiser bicycle seat for women and men. LIGHT weight, the sort cushion make you comfortable for long time cycling. If you have any questions about this product by Rock Rider, contact us by completing and submitting the form below. If you are looking for a specif part number, please include it with your message.